Have You Suffered a Personal Injury and Have Questions? IF YOU OR A LOVED ONE ARE INJURED OR KILLED BECAUSE OF SOMEONE ELSE’S FAULT WHAT SHOULD YOU RECEIVE AND WHAT ARE YOUR RIGHTS? Will I be paid for the time I’m losing from work? What if I don’t make a full recovery and cannot return to my job? How will I know if the insurance company’s offer is fair? Do I need a lawyer to help with with this case? The attorneys at Walker, Billingsley & Bair can help you learn about your rights and find the answers to the questions you have. Not all attorneys have the answers, but you can be sure that the attorneys at Walker, Billingsley & Bair can lead you to recovery. Call Us Now at 641-792-3595 to learn more about your rights and how we can help you. Don't Make Mistakes that Will Ruin Your Case and Your Chances of Making a Recovery! Our attorneys can protect your rights after a personal injury. 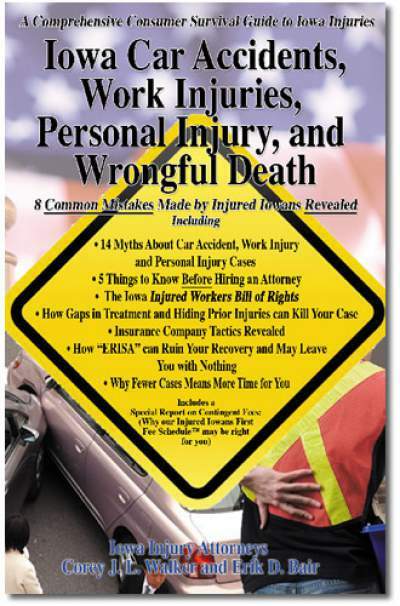 You can learn why not pursuing your claim is never a good idea in our FREE book, along with other common mistakes personal injury victims make with their cases. We share all this information for FREE - request your copy today! What do I have to prove to win a personal injury case? What if there isn't enough insurance? Our attorneys have seen too many personal injury cases ruined because victims weren't informed of their rights, and as a result made common, but damaging mistakes. Don't lose your case because you don't know your rights or have the help of an Iowa personal injury lawyer! Before you sign anything for the insurance company, consider taking advantage of our firm's FREE and confidential legal consultation. CALL NOW at 641-792-3595 to get free information that can save your case. There is no obligation to hire us, and you will pay no attorney fees unless we win your case. If you prefer, complete our confidential contact form to receive the information.